Western Digital announced today the launch of its first 4TB mechanical storage offering aimed at desktop consumers -- the 3.5-inch, 4TB, 7200 RPM WD Black (WD4001FAEX). With an MSRP of $339.00, Western Digital claims their new drive is the fastest 4TB out there with a sustained throughput around 154MB/s. Here are the specifications (pdf). SSDs are an obvious choice when choosing a fast drive; however, with the cheapest 512GB SSDs hovering $350, having massive amounts of ultra-fast storage space seems to come at an unreasonable premium. 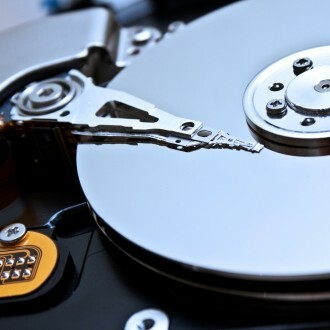 Based purely on matters of price, mechanical drives will continue to be with us for some time -- a truth that Western Digital hopes to capitalize on by providing speedy mechanical drives with gigantic capacities. The WD4001FAEX features all the usual suspects like a 6Gbps SATA connection and 64MB of cache, but also boasts a 5-year warranty -- an important feature for anyone who's had experience with mechanical hard drives. WD is also touting its dual-processor, dual-actuator, StableTrac and NoTouch technologies. In the past, manufacturers had often sacrificed rotational speeds for capacity when it came to largest, newest models. With the advent of 3TB and (especially) 4TB models though, mechanical drive makers have been pushing the envelope with almost entirely 7200 RPM options. This isn't the first 4TB drive Western Digital has released, but it is their first offering aimed at non-enterprise users. Other models like the WD4000FYYZ are part of WD's "RE" line-up which features a short Time-Limited Error Recovery. TLER is a beneficial feature for most RAID setups but a potentially bad idea for single drive configurations.